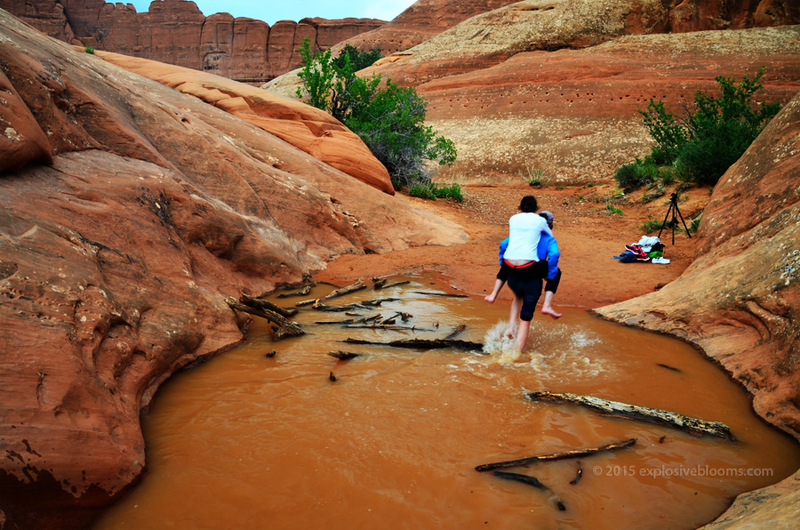 The weather has been a bit wetter than usual in Moab. We have had showers for the last two days, but they usually occur in the early mornings, which has been lucky for us. 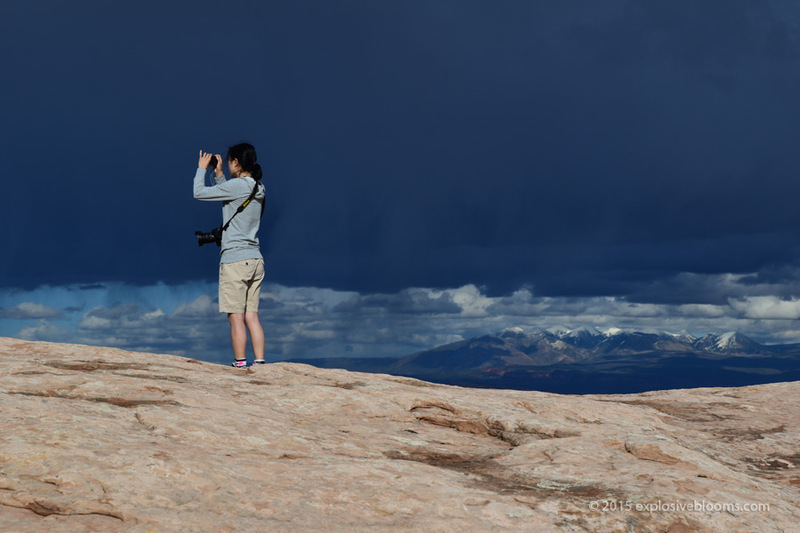 The skies have been cloudy with sunny breaks, but we have seen storm cells in the distance. This has made for some interesting photographs, so I can’t really complain. The mixed skies has also made the hikes easier because full sun would make the uphill battles a lot more challenging. 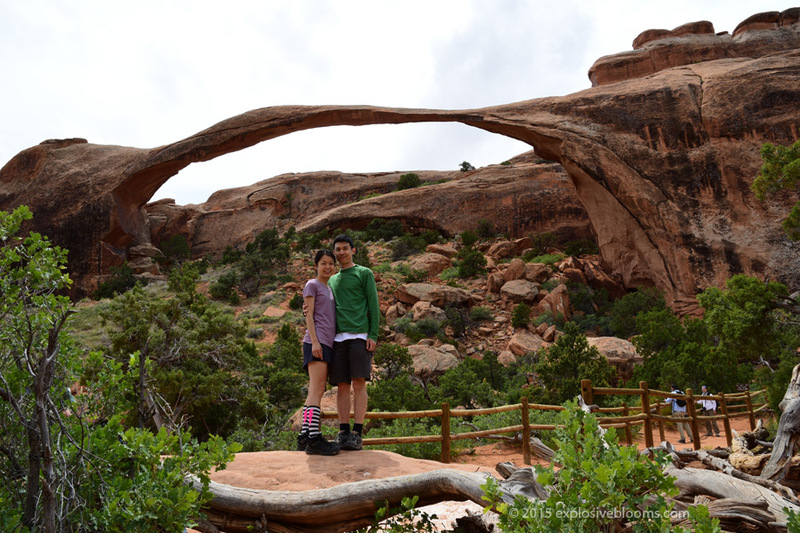 On Friday, we visited Arches National Park and hiked to Devil’s Garden to visit Landscape Arch, which is the longest natural arch in North America. 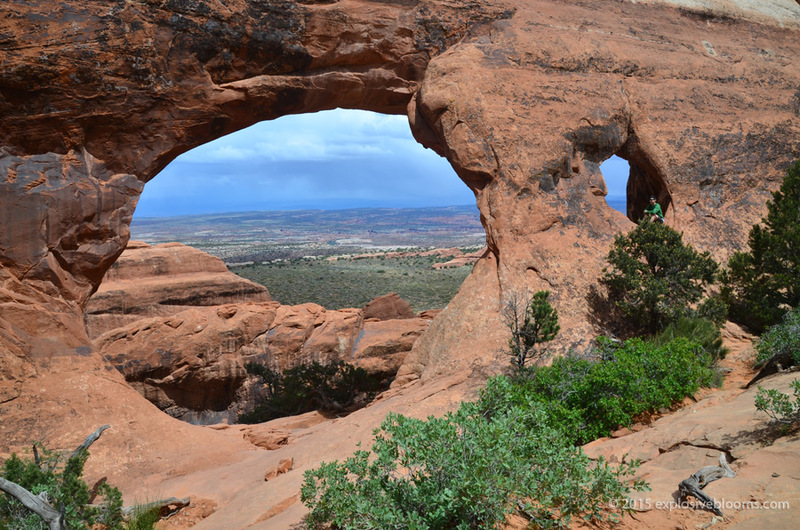 From here, we continued on to the Double O Arch. The first bit was quite steep. 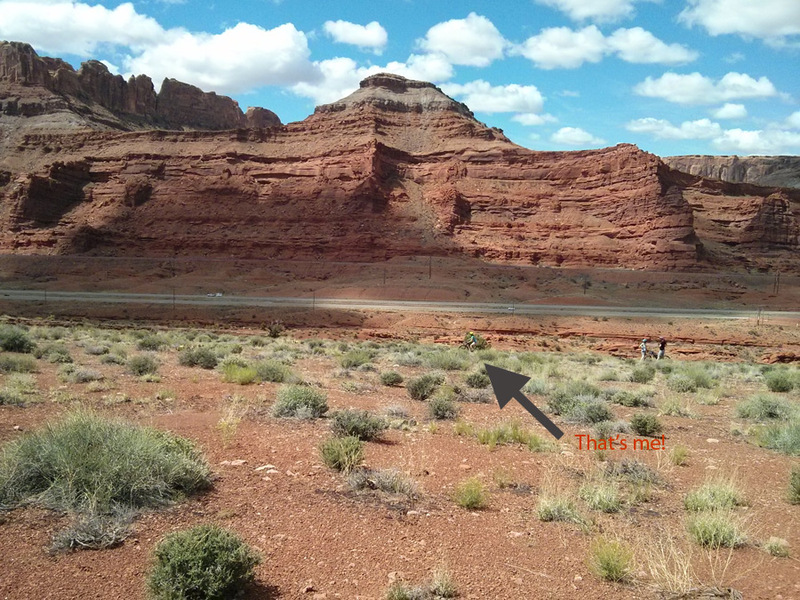 The picture below is with me halfway up, looking back down. 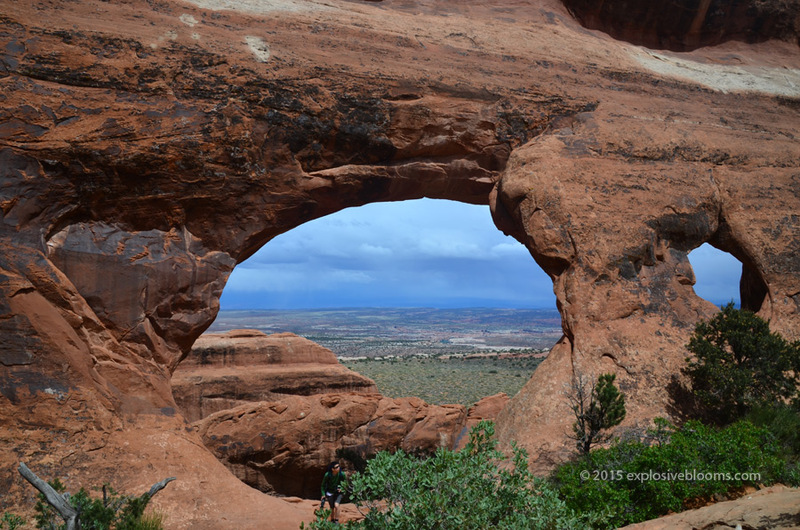 On our way to Double O, we stopped at Partition Arch. You can see it behind me. It was amazing just sitting there, looking down into the canyon. We continued on and took the primitive trail back to the car. 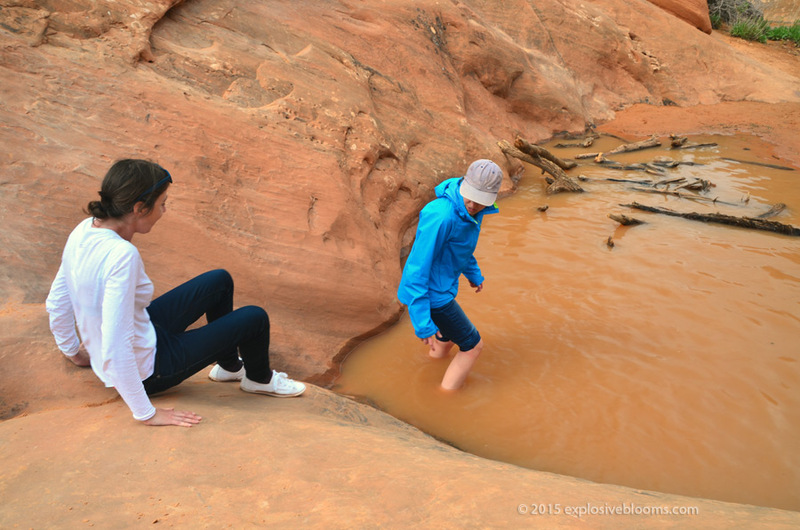 We came to a spot that had collected knee-deep water, so the options were to wade across to the other side, hug the huge rock and shimmy across with the chance of slipping into the water, or running up and over the rock. When I say rock, it’s large. We watched two french women cross and it was both sweet and funny. The one woman took off her shoes and socks and rolled up her jeans. She waded across the watering hole with the bags. I asked her friend how she was going to get across. She told me her friend was going to carry her across. Watching this was comical. The friend was taller than the woman in the water, so when the friend mounted, they almost both fell head first into the water! But it worked out and they successfully made it across. That is real friendship! This event made me think of my friend Karen. I could totally see her being the girl in blue, willing to carry me over to the other side, and we’d be laughing the entire time. 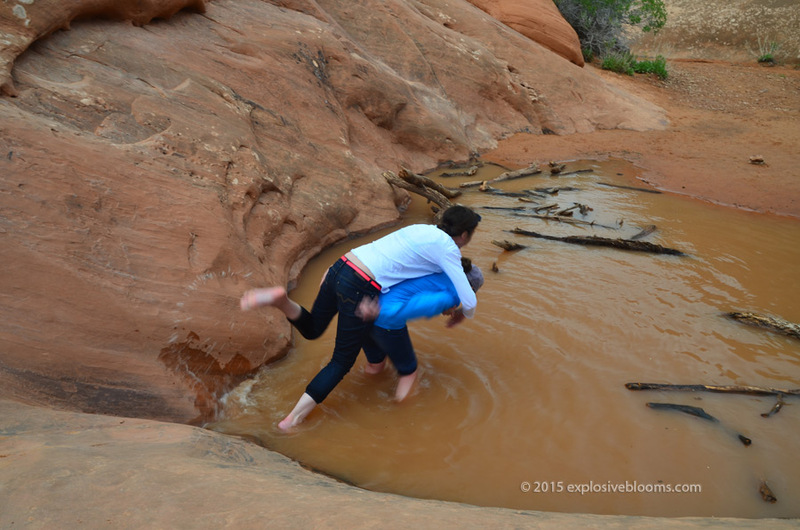 Hubs didn’t want to get into the water, so he ran up and over the rock, first with all of his stuff, and then with mine. 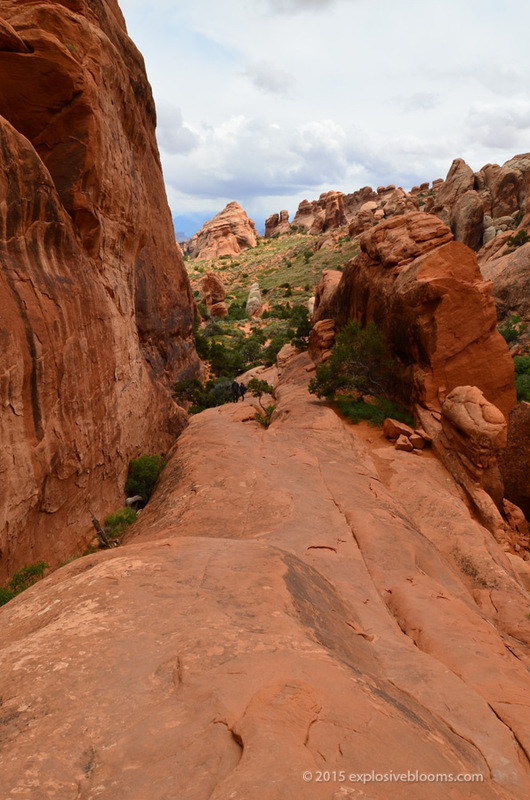 Unburdened by my backpack or camera, I was now expected to follow and clamber up the rock and down the other side. It’s a good thing that the canyon rocks are mostly grippy. I took a little leap and scrambled up as quickly as possible. The key is to maintain momentum so that there’s not chance to slip back down. Yesterday we visited Canyonloands and hiked up to Upheval Dome, where we had the opportunity to look into a large crater that was created by a meteor that hit 200 billion years ago. What struck me was the silence. For a long time, it was just me and hubs at the site. The silence was deafening. 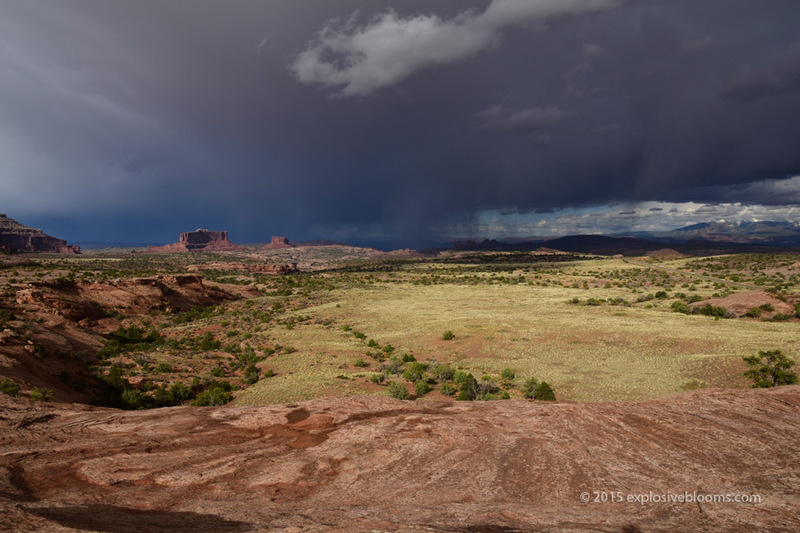 Canyonlands National Park is huge. 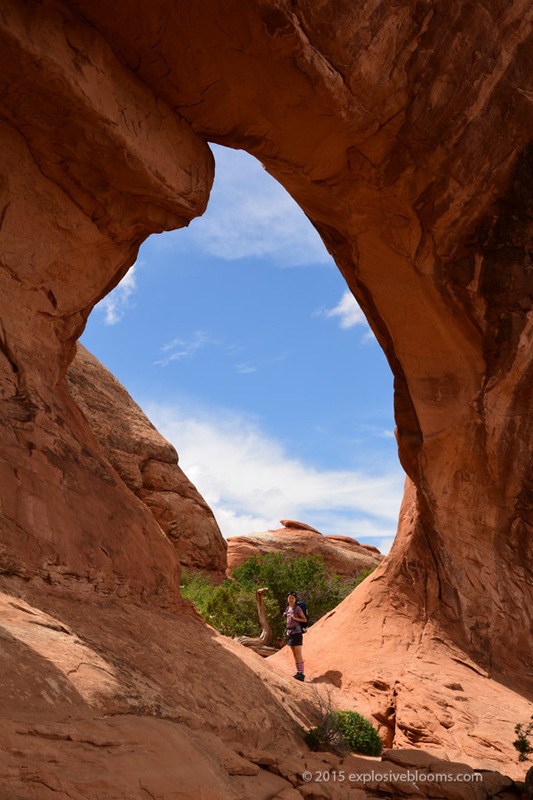 There are many outlooks that you can drive to, and there are a number of hikes. 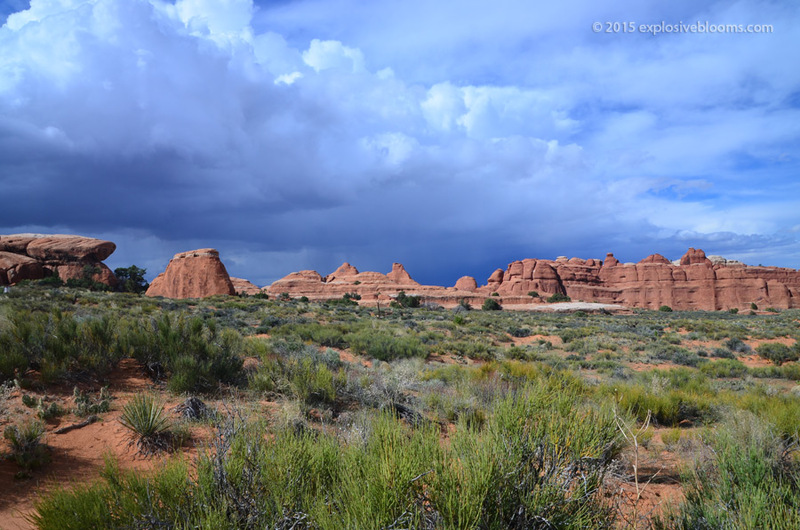 Due to the possible inclement weather, we opted to drive to the vistas and will do more hiking tomorrow. Today we woke up early to get to Moab Cyclery. We signed up for a beginner’s mountain biking experience. I was excited and scared, but once I had a chance to get on the bike and gain an understanding of what the 29ers were capable of, I had such a fun time. I might even describe it as an adrenalin rush, as I rode over rocks and through mud. My favourite was cornering and as we hit the beginner-intermediate trail, I was able to pick up my speed as I flew around corners. Mountain bikes are very different from road bikes. Being a roadie, I am always avoiding rocks and any debris, so at first, I was weaving around rocks on the mountain bike. But as soon as I figured out that the suspension on these bikes allowed me to ride over rocks, I started doing that on purpose. Eric, our guide, was very patient and enthusiastic. At the start of the ride, I was very apprehensive to ride down my first drop. He was encouraging and guided me down. It turned out to be very easy to do. Mentally, being able to do that set the tone for the rest of the two hour ride for me. It helped me gain the confidence I needed to do the rest. The only other scary part was the first single-track section we encountered. It was downhill, rocky, and was a corner. It was also on a ledge. I did it. The key is to always look ahead, and where you want to go. Mountain biking requires you to be able to think and process information quickly. When you are going downhill and are approaching a corner, you’ve got to commit to the corner and power through it. Breaking around a corner, especially if it’s on a narrow trail, can cause you to lose control. I learned that if it’s smooth ground as I’m approaching the turn, I can lightly pump the breaks if I’ve picked up too much speed, but I’d either coast through the turn, or continue pedaling. Sometimes my back wheel would skid a little, but that was part of the rush. As you’re cornering, you still have to look ahead to find your next best line. There was one section where I did think I was going to face plant because I had chosen to go fast around the first turn, not fully realizing there was another turn almost immediately and there were some huge rocks. 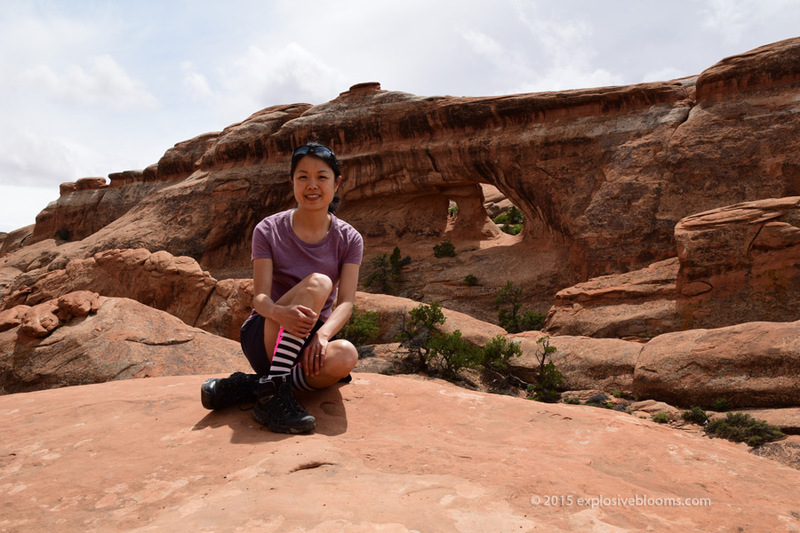 I made the split second decision to squeeze between the first set of rocks and then up the next rock. Somehow, I came out of those turns unscathed, and in my heart, I was cheering myself on. We got a little muddy. What a rush! 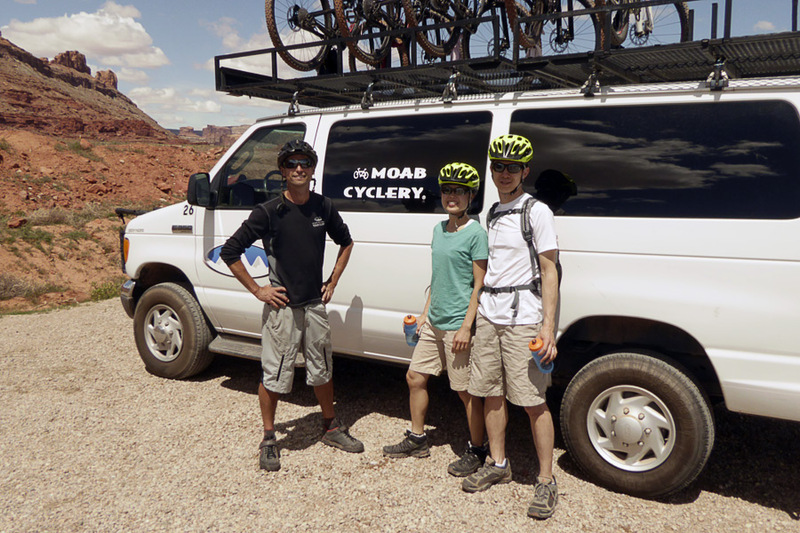 If you find yourself in Moab and wanting to go on a guided mountain bike ride, I highly recommend Eric Boxrud of Escape Adventures. He’s a great guide with years of experience. He also has a fun sense of humour. My favourite line was, “A bike is not a horse.” He’s referring to how many cyclists tend to kick their leg up and around to mount. (I do that). As an aside, Eric knew guys that were in the movie, 127 hours! If I lived out here, I’d definitely take up mountain biking, but I dont’ think it’s something I’m interested in doing in Ontario. Mountain bking here is a whole different thing. In my mind, it’s more technical. I like riding on rocks. In Ontario, mountain biking would take place in a forest, which means there are lots of trees that I can wrap my bike around. I guess if you want to think about it like that, I could ride off a cliff here and crash into the bottom of a canyon. 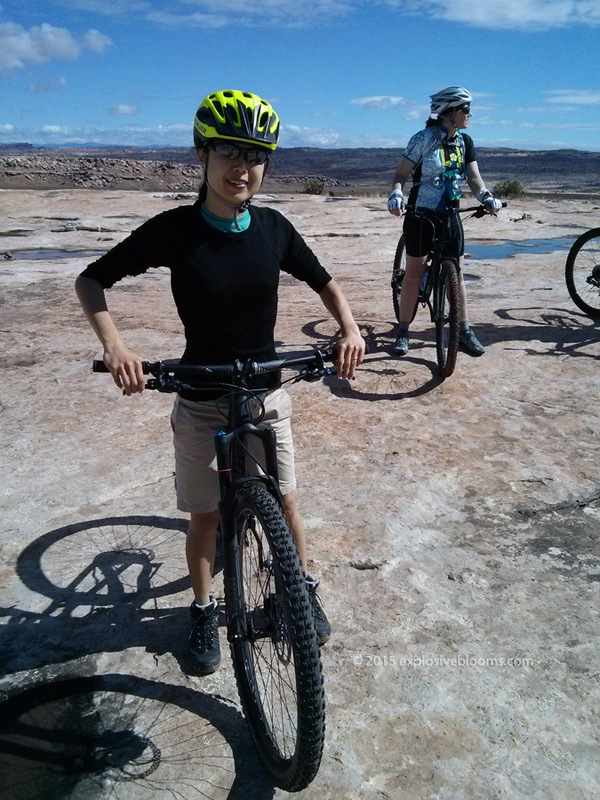 I would love to come back to Moab and road bike. They have built some really beautiful bike lanes here. 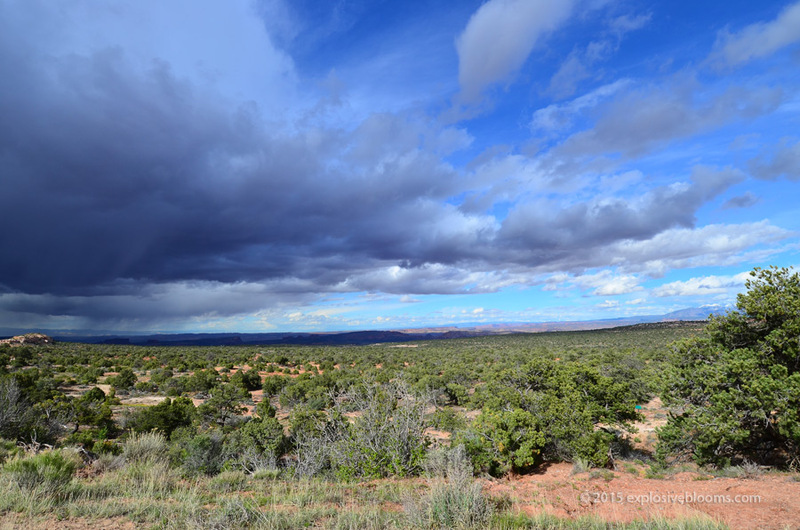 Hubs wants to climb the La Sal mountains. 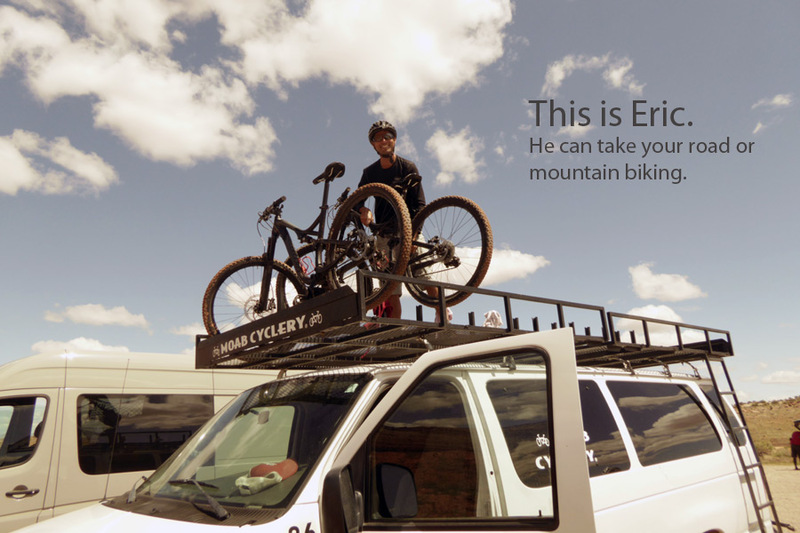 Eric has climbed it both by mountain bike and road bike. By road bike, I believe he mentioned you climb 8,000 feet (?!) and there is one section that is an 18% grade. Uh, I thought it was a vacation?